What Size Banners Do You Need For Stageline And Mobile Stages? Planning your event with an outdoor mobile stage is a large scale project that entails much forethought and planning. From the stage rental, the lighting, and of course the talent that will be playing on your mobile stage, you'll need to spend time with your planning committee to nail down the specifics ahead of the event. One key factor that is often left to an afterthought with little lead time before your event is banners for your Stageline mobile stage. But your sponsors will want that recognition on the stage, and your event photos that fans will post on Facebook and Instagram must have your branding in the banner design. Therefore, it's key to start thinking about stage banners for your mobile stage rental well in advance. 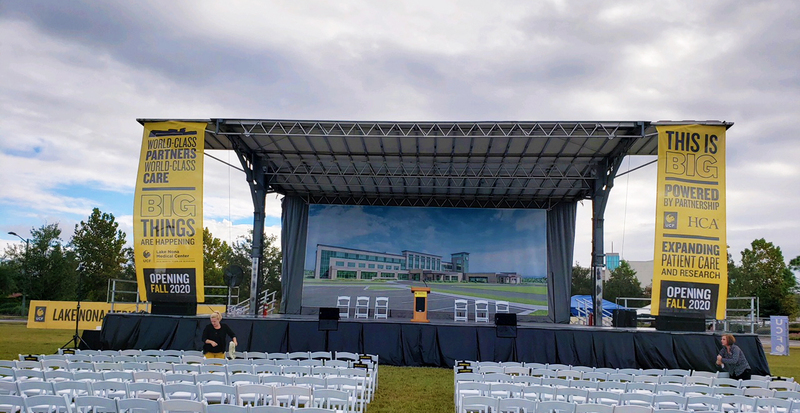 Stage Backdrop: 12' 8" x 23' 6"
Option 1 - 12' 6" x 30' 8"
Option 2 - 12' 6" x 32' 8"
Stage Backdrop: 17' 6" x 30' 10"
Option 1 - 5' 1" x 46' 3"
Left And Right Speaker Banners (Stage Scrims): 26' 4" x 15' 10"
*Note: Although the official Apex 3224 banner spec book lists 4' high for the header, according to our official Apex sales representative, a 3' high top header banner is ideal. The sizes for stage banners for custom built stages obviously vary greatly. Ask your rental stage company for the exact sizes, or you can put us at NorthCoast Banners in touch with your stage company and we'll be happy to work with them to determine the sizes. Your Stage Rental Company Is Going To Hang The Banners; Check With Them Too! We always recommend to our clients to double check the sizes and specifications for their mobile stage banners with your stage rental and lighting company. Their crew will be the ones rigging up the banners and they may have specific needs and sizes. For example, one of our NorthCoast Banners' clients takes 2" off all Stageline official banner sizes, so that the stage banners hang tight without sagging like a sail. Many other clients stick with the official sizes. Always check with your mobile stage rental company before finalizing your stage banner purchase. Do you need more information on how to buy the correct banners? Contact us today and we'll be more than happy to help. Our experienced sales team has over 30 years of experience working with banners for many mobile stages across the US.